In Tel Aviv or Haifa, the occupied territories are another planet. But if Israelis feel economic pain, they will demand change from within. The Rolling Stones have confirmed they will play a gig in Tel Aviv in June as part of their 14 On Fire tour. Inevitably, they are already under pressure to cancel their appearance in "apartheid Israel" by the Boycott, Divestment and Sanctions movement,a campaign that has had mixed success. The academic rock star Stephen Hawking and Pink Floyd's Roger Waters are firmly in the boycott camp, while the author Ian McEwan and the musician Alicia Keys have resisted pressure to pull appearances. But there's little doubt that the drive for a boycott of Israel in protest at its 47-year occupation of the West Bank, East Jerusalem and Gaza is gathering steam. The latest body to back a boycott is Riba, Britain's leading architectural association, which last month called on the International Union of Architects to suspend Israeli membership on the grounds of "complicity in the construction of illegal settlements and other violations of international law". The boycott movement was boosted earlier this year by publicity surrounding Scarlett Johansson's endorsement of SodaStream. How many people before then even knew that SodaStream was based in Israel, let alone that its main manufacturing plant was in a West Bank settlement? The US secretary of state, John Kerry, performed a similar service when he warned Israeli leaders of the consequences of a failure of current peace talks. "The risks are very high for Israel," he said. "People are talking about boycott. That will intensify in the case of failure." Kerry is right: more people are now talking about boycotting Israel than ever before. The issue is gaining traction even among US academic bodies, previously thought impervious due to the oft cited "unbreakable bond" between the two countries. Israel is angered by the boycott calls, and alarmed at the movement's momentum. The prime minister, Binyamin Netanyahu, recently launched an attack on Europe and its dark history. "I think the most eerie thing, the most disgraceful thing, is to have people on the soil of Europe talking about the boycott of Jews. In the past, antisemites boycotted Jewish businesses and today they call for the boycott of the Jewish state … the boycotters must be exposed for what they are. They're classical antisemites in modern garb." This is a serious charge, and one that causes deep discomfort to many who want to bring pressure to bear on the Israeli government over its policies towards the Palestinians, but who also vigorously oppose antisemitism in any form. Opposing the occupation does not equate to antisemitism or a rejection of Jews' right to, and need for, a homeland. The repeated accusation of antisemitism does not make it true, however frequently it is levelled by those who defend Israel unconditionally. But this is not to say that there is unity within the boycott movement. Many draw a distinction between a settlement boycott – rejecting goods originating in Jewish colonies in the West Bank; cutting ties with settlement-based institutions; or demanding international companies divest from enterprises with links across the "green line" – and a boycott of Israel itself. Mahmoud Abbas, the Palestinian president, has made his position clear. "We do not support the boycott of Israel. But we ask everyone to boycott the products of the settlements," he said in December. Critics of Israeli policies who oppose a boycott of Israel itself argue that ordinary citizens should not be penalised for the government's actions; that dialogue with academic, business and cultural bodies is more productive than shunning them; and that the shameful history of boycotting Jews makes this option impossible to contemplate. But others – increasingly frustrated by Israel's intransigence, the dismal prospects for the peace process, and the failure of the international community to back up critical words with meaningful actions – say that only when Israeli citizens and institutions feel the consequences of their government's policies will they force change from within. Many Israelis are shielded from the occupation. 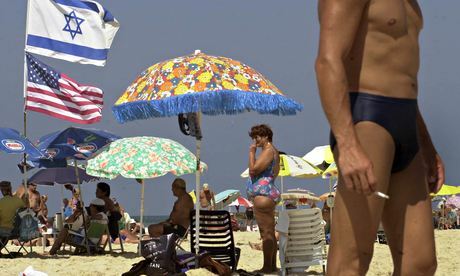 To those soaking up the sun on a Tel Aviv beach or working in a hi-tech hub in Haifa, Gaza and the West Bank feel like another planet. The daily grind experienced by more than 4 million Palestinians living under military occupation just a few dozen miles away barely registers. A boycott – whether it's the ending of academic links; the refusal of artists to perform; the divestment of international companies for reputational reasons; or a consumer rejecting Israeli produce in the supermarket – has the potential to jolt Israelis from this somnolence. Of course, there's a risk of such pressure entrenching Israel's stance. But Israel frequently proclaims itself to be the only true democracy in the Middle East. Should its citizens demand an end to policies that have brought them economic pain, isolation and global opprobrium, their government will surely be forced to take notice.